Served two years !954-56 with the Fourth Infantry Division Band in Frankfurt Germany. Graduated 1963 with a PhD in Chemistry, U of Wisc. Retired May 1997 and spent the next year rebuilding my basement after the Flood in Grand Forks, ND. Moved to Newark Ohio in November 2001 in order to be near our Sons and their families (5 grandchildren). After moving to Newark, my wife and I have spent the past 12 years doing volunteer work. I started doing taxes with the AARP, gardening, and taking charge of the church building and grounds upkeep. 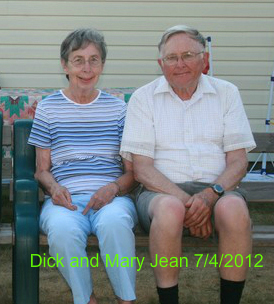 With the advent of Parkinson's disease with my wife,Mary, we have become active in the local Parkinson Support Group. Mary's Parkinson problems have almost put her in a wheel chair. I am getting our bathroom setup for that possibility. We planned well because our son and his wife live only 2 miles away. Rick is a doctor and he is a great help with Mary. Richard Baltisberger posted a message. Happy birthday Bob. I hope you are in good health. Happy birthday Darol. Now we are both 84 and never thought I would live that long. I can't fish any more because my wife can not be moved to where we fish, but my son makes up for me. He caught a huge muskie last year. We are planning on depositing my ashes on our favorite reef at the lake of the woods, but that seems a long ways off yet. Have a good birthday. Richard Baltisberger has a birthday today. Richard Baltisberger posted a message. New comment added. Richard Baltisberger has left an In Memory comment for Profile. Richard Baltisberger updated profile. View. Happy birthday Darol. Now we are both 83. I made it today on the 17th of February. My brothers are both over 93 now, so I plan on being around for awhile. Happy Thanksgiving to everyone. I get on the site every now and then to keep track of you all. I miss corresponding with Packy who left us this past year. Paul I am sorry to hear about Grace. Mary jean continues in her tenth year battle with Parkinson's. She can still use a walker to get around and our two sons live nearby so they are a great deal of help. Rick is a local doctor and will come immediately whenever I call for assistance. Jay lives in Berea Kentucky and visits once in awhile. Next year he is coming up for another sabbatical leave from the university and he plans to stay with us during the week while working with a professor at OSU. OSU football blew their chance at a run for the National Title with an upset loss to Iowa. Merry Christmas to Everyone for 2015. This is our family Swiss Tree which we put up every year. Baltisberger is of Swiss Origin and the van in the front of the tree was taken by friends in Switzerland. Apparently these Baltisberger's sold sandwiches and pop out of the rear of the van. Happy Birthday, Packy, I miss seeing you after all these years. I don't want to review all the trouble we got into, but it was good to have you as a friend. I hope your health is good. I am in good health. I have to be because all my time is taken up caring for my wife who has Parkinson's disease in its eighth year. Happy Birthday Darol. I know your birthday is a few days away, but this is close enough. I hope your health is good, mine is. Thank god because I have to take full time care of my wife, who is almost in a wheel chair all the time. If anyone else reads this and has a parkinson problem, let me know I have been at the defense of the disease for eight years now. Richard Baltisberger has a birthday today. New comment added. Here are my wife and I at our 50th Wedding Anniversary Celebration on Jan. 17 2015. 50th Wedding Anniversary Celebration picture. Sons, Rick bottom row and Jay in the Back. Their Wives, Jane and Julie are in the back row.